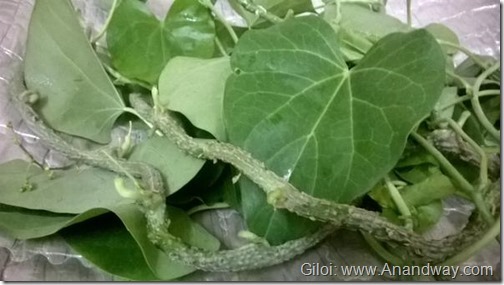 Guduchi, Giloi, Amruth or Tinospora cordifolia herb as a daily immunity booster in India, Sri Lanka and Myanmar. 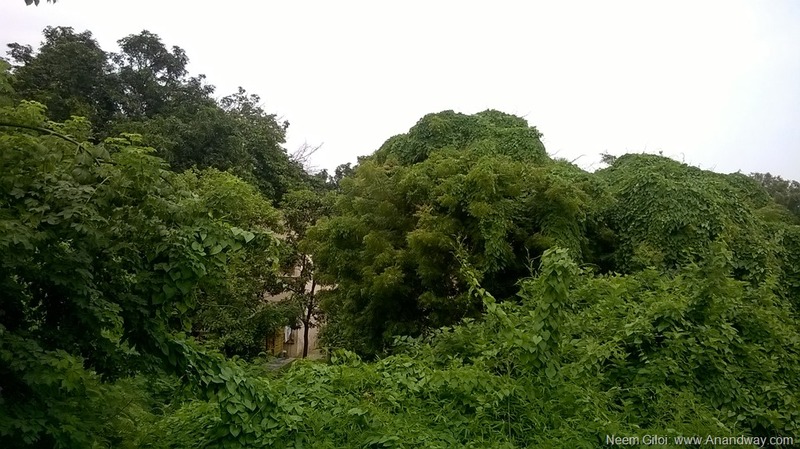 The monsoons in India find this wonder herb Giloi, which is as potent as the famous Tulsi as an immunity booster, growing over trees in almost all jungles and gardens and parks in cities. It grows easily from seed or cutting. The thick stem is used as medicine/immunity booster. I find it work every time on fever and fatigue, and as a great prevention for exhaustion or fever. If you have access to fresh Giloi, it can be churned in a blender and strained with water, and taken as a fresh juice in small quantities. For my Vata Pita constitution, it is truly Amruth or elixir of immortality! It is a super detox agent. Giloi is growing all over the neem trees and bamboo in front of my house in Lucknow, India. Your Ayurvedic doctor will tell you how it specifically affects your body type and you in particular, after a pulse diagnosis or Nadi Pareekshan, the ancient Ayurvedic technique of health diagnosis to prevent future illness and cure any current imbalance. Patanjali Yogpeeth has made Giloi Kwaath easily available as a dry powder for just Rs 15 for a month’s supply that can be used as a daily tea with Tulsi or Mulethi. The sweetness of mulethi or licorice takes away from Giloi’s bitter taste. Giloi is available as tablets/capsules from brands like Himalaya and Sri Sri Ayurveda. How to fast for health? Why garden herbs find a place in city life?